Don't get me wrong, I'm all for green technology—so long as physical effort is not required. That's where the Power Pump cellphone charger from Orange falls a bit short. 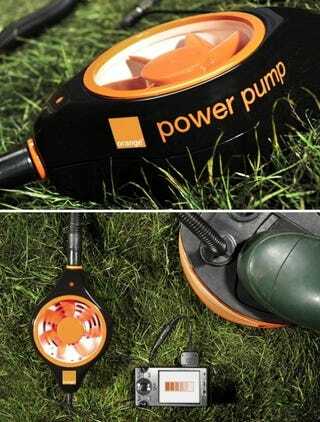 Should you find yourself with a dead battery when you need to make a call, the Power Pump can provide emergency power via a turbine driven by a foot pump. Apparently, you can generate around 5-minutes of juice in the same time it would take to inflate a standard-sized pillow.